Eternity #2 continues with Abrams and Myshka searching for their son beyond the edge of the galaxy. It opens up with members of the Future Light preparing to sacrifice the child to turn him into the new Observer. However, the ritual is interrupted when a being named Krakor attacks with his warriors called the Sky Bolts. Krakor is able to get the jump on the Future-Light and take the child before the ritual is completed. 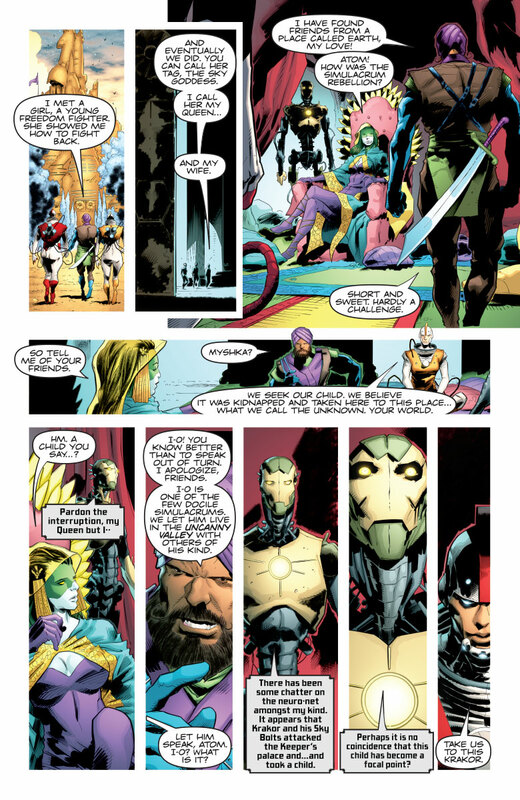 Doctor Tear, the one investigating the Observer’s death, finds it highly suspicious that Krakor attacks when there are unwelcome guests from Earth. Meanwhile, Abrams and Myshka aren’t sure where they are or where they’re heading. They don’t recognize anything from their first trip beyond the unknown. Abrams does know that they are close because he can sense their child’s thoughts. As they make their way through the land they encounter Ragad the Unstoppable. He listens to their story and tells them of one who can help. But what do these various groups want with their child? And are they too late to make a difference? As one who loved the Divinity series, I was excited about all the possibilities in this one. Just looking at the cover by Jelena Kevic-Djurdjevic excites the mind and sparks the imagination about what lies beyond the known. So I admit I was slightly disappointed when I saw Krakor looking like a caveman with a jetpack. 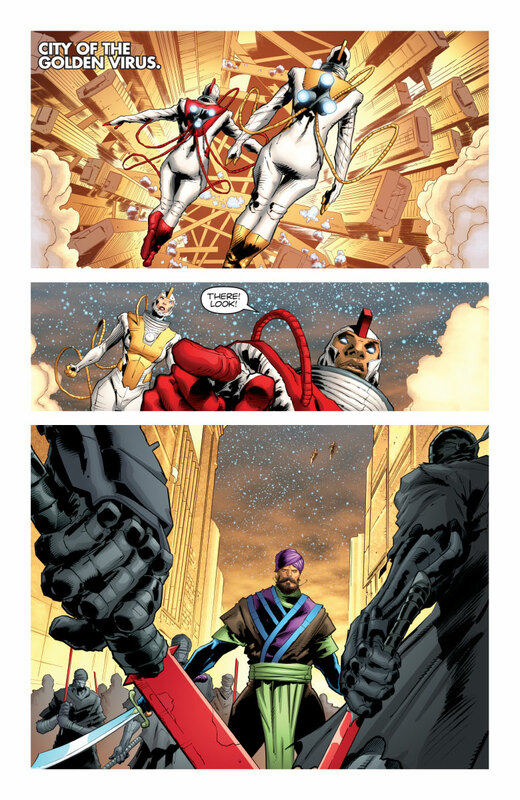 Thankfully this first appearance didn’t last too long, and the story shifted to Abrams and Myshka. Their exploration of the lands and their encounters with the inhabitants gave a much better picture of the unknown. When Myshka and Abrams met Atom-13, I started to wonder where the story was heading. Even though I found this part and its characters intriguing, I wondered how it would fit with the greater story. It wasn’t until they would be attacked and also meet Krakor that things would start coming together. The conflict between the Past-Light and Future-Light was more compelling than just simple conflict similar to what could be found on Earth. And I’m curious to see how much this series will delve into the nature and/or limitations of Abrams and Myshka’s powers in this strange land. 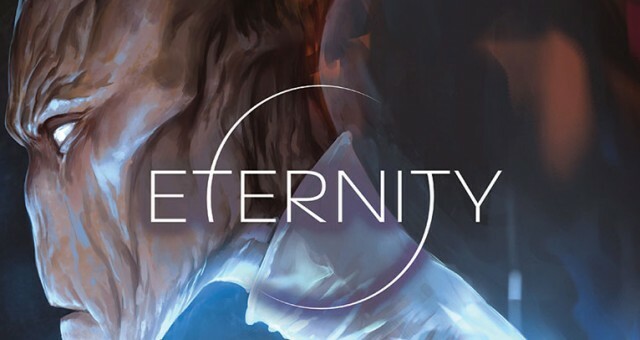 Eternity #2 is entertaining in the way it breaks down the conflict between the Past-Light and Future-Light but some of the lead up to that is uninspired. I understand that this world’s environment and its characters have to be established but I was disappointed it didn’t feel different from Earth. Considering how fascinating Abrams and Myshka’s abilities are I hoped this issue would show more things reflective of that. However, I’m looking forward to see where Abrams and Myshka’s journey takes them next.